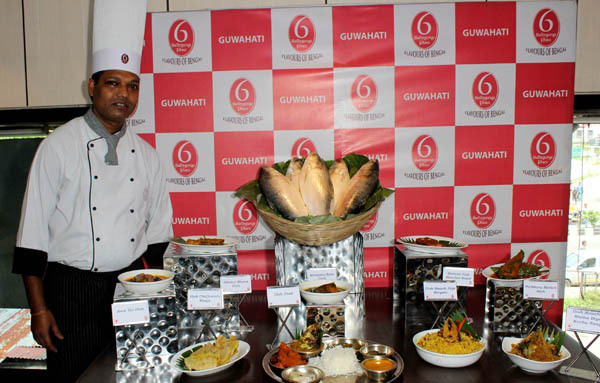 Guwahati restaurant 6 Ballygunge Place is hosting the Ilish Festival from August 23 to September 9 for fish lovers. It is an annual event of the restaurant. The festival will present an assortment of delicious dishes including Ilish Chalkumro Bhaja, Dhakai Bhuna Ilish, the heavenly Badami Ilish Macher Roast etc. The Ilish Festival is aligned with the season and availability of the fish and the menu has been curated by Sushanta Sengupta, director and celebrity chef of 6 Ballygunge Place. The festival menu offers many tantalizing ilish items like Aam Tel Ilish, Purbhora Morich Ilish, Ilish Maach Diye Biryani, Kalojeere Bata Ilish and much more. The festival will also offer a comprehensive Ilish Thali, priced at Rs. 1,100 (plus GST), consisting of a number of Ilish specialties like Ilish Macher Tel, Ilish Macher Dim Bhaja, Ilish Macher Mathadiye Kochu Saag, Badami Ilish Macher roast and finally concluding the meal on a sweet note with a lip-smacking Ilish Peti Sandesh. The festival special dishes are priced between Rs 275 to Rs 600. Keeping in mind food safety, the restaurant has a R&D team who carries out repeated tests of the food in the restaurant. The restaurant in Kolkata has won numerous awards and recognitions from esteemed organizations likeLonely Planet, National Geographic, American Express, The Telegraphand many more. It is also the first retail outlet in India to register its address as a trademark.